Patchwork goodies, quilts and housewares. I buy half a yard and later I am mad at me because I didn't buy more. Looking for something I what??? Yes, but still wondering if it's a good idea... I wash them as soon as they get home. Yes, I would love a new iron!!! By color. I have a bunch of clear plastic shoe boxes : one is for my green prints, one is for my solid greens, one is for my blue prints, one is for my solid blues, and so on. 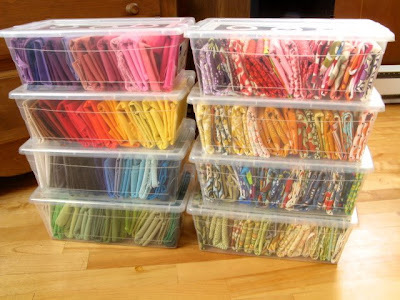 Even my scraps are sorted by color. Not really, as long as it fits in my boxes. All my plastic boxes are stacked in one corner of the room. But I would like to buy shelves soon. When do I say what is what? Hey! I've spent so much money and time to build my stash.. now you want me to bust it up?? Ok, ok, I would do an awesome quilt, a Grandmother Flower Garden Quilt. Click here to see more. Do you have a current favorite print in your stash? A favorite? Only one?? Are you crazy??? It should look like a chromatic circle and makes your heart goes boom boom. Wow, we have the same favorite print! 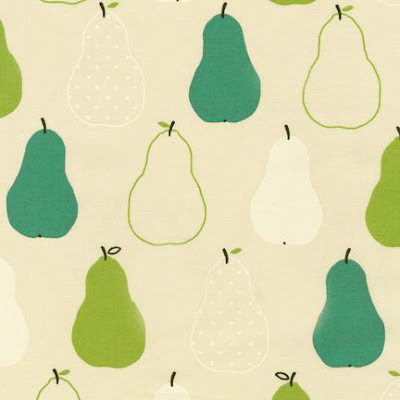 I just got my yard of the same pear fabric, but in the red/orange colorway. I made a grandmother's flower garden too, it's a couple pages back on my blog if you want to see it. hooray for having a massive stash I say! We should embrace it not be ashamed! I've more fabric than I'll ever need and still buying! I think we share the same stash-building technique! Grandmother's flower gardens always look so sweet, I'd love to make one of those someday. Thanks for sharing your stash! 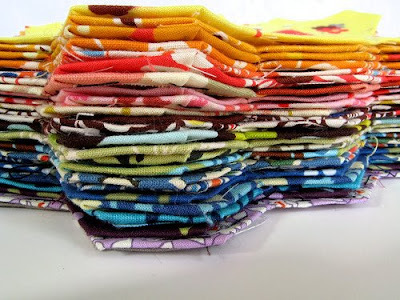 I think I'd give up a few teeth or months off my life for that kind of quilty stash. Delicious!